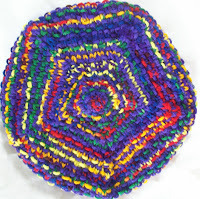 There is hardly a knitter in the world who doesn't have an odd ball of some beautiful, or zany or interesting yarn. We buy them—because they are so beautiful—and often—a bit more than we can afford—But desire over whelms us. Worst of all, the yarn is discontinued(or an antique!) —So what are you going to do? Not enough to make anything with—and no way to get more—even if you wanted too! Somehow, we all end with a few of them-- single skeins—and then what? What to do with 100 yards of yarn!? My stash has lots of these odd left overs. Every thing from some odd ball of Noro yarns, to antique Red Heart (so old, (30+ years) is actually wool, not synthetic! I have been working on knitting all the odd balls in my stash—trying to figure out ways to make the most of them. Sometimes, with small skeins, this means pairing them up with an other yarn. But I don't always want to end up with stripes--and some yarns just aren't suited for color stranded work (and I don't want to do anything to complex--) BUT most of all, I want to be able to use them up. Sally Lunn is one answer! Sally Lunn (in case you didn't know is an English(and American ) bread. It looks like a normal loaf—but it's not—the dough is a rich eggy one. It is Broiche (the bread!). In France, Broiche, most frequently, is baked in fluted pans, and usually has a 'top knot' --the shape of the classic bread is why the knitting stitch gets its name. So a Sally Lunn(the bread) is a Brioche—but simpler.. and My Sally Lunn (the hat) is a simple brioche pattern—but it still packs a punch! 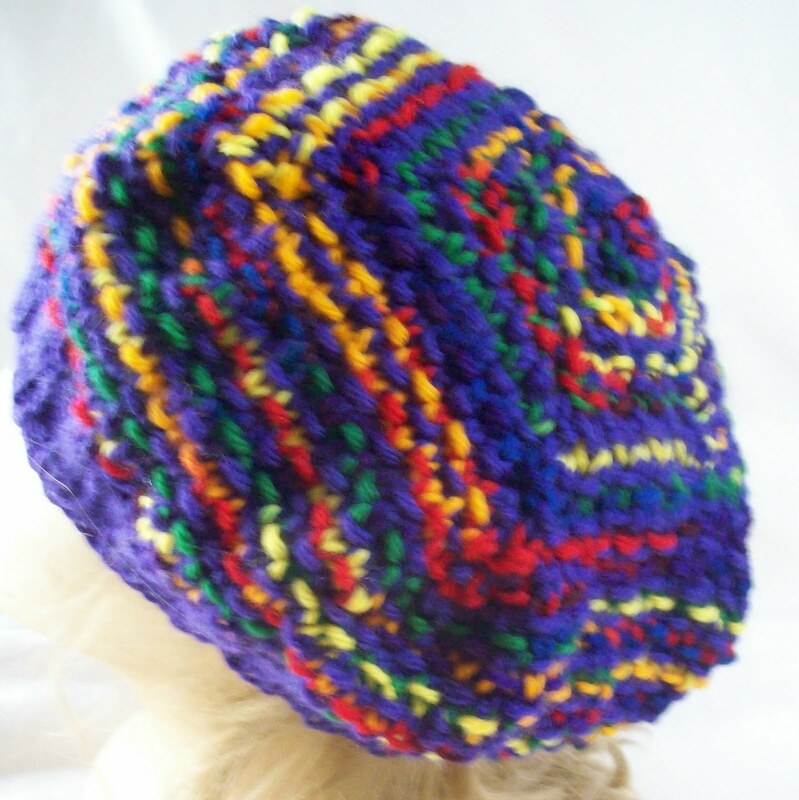 Easy to knit, but special! 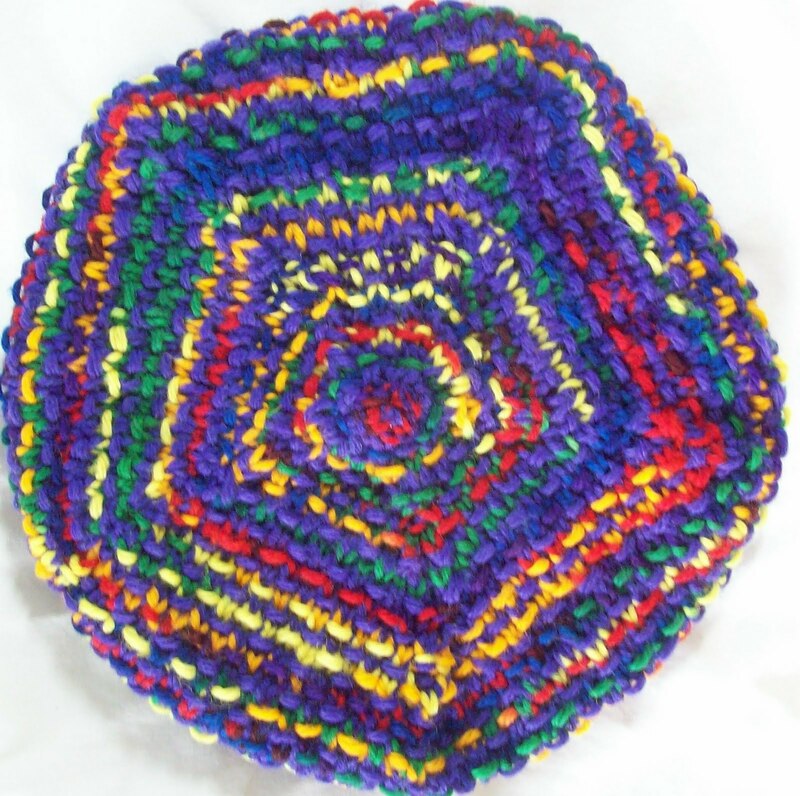 Richly textured, and a totally unique looking stitch—A simple beret made better. Version 2 is bold –The bright colorway is an antique-Red Heart—WOOL—the solid is Patons Classic Wool. Both are worsted weight. 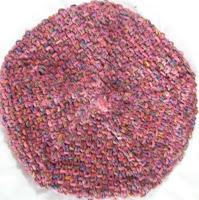 Slight smaller (10 inches across) It will fit most women and children-(it fits me, too, but only as a beret). While both versions are shaped as classic berets –and lie flat—the brioche stitch makes a dense, and at the same time, soft fabric, so they wear like slouch hats. 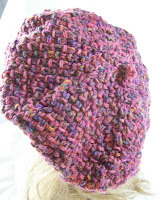 The brioche stitch creates a dense, textured stitch too, so hat is warm, too. I am working on some other swatches—to give you an ideas for other combinations. But it's easy to see in these two samples—the pattern stitch —and the yarn choices can make for some very different results. Bright yarns can be toned down, subtle yarns can be stretched with a near matching semi solid. Small amounts of home spun or hand painted yarns could be worked up into something special. The winter is coming, it's time for hats. This Sally Lunn is just the way to make them. Clean out your stash, use up those odd balls, and make something special at the same time!